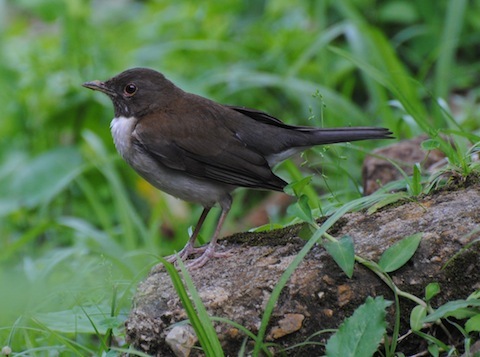 The White-necked Thrush is seldom seen in its mountain forest habitat. It ensconces itself in the nooks and crannies of the forest while still being clearly heard. It can also be likened to a blues singer for it whistles, a sad but melodious tune. Its song is one of the first to be heard on an early morning in our rainforest. The Thrush often calls from the undergrowth which it frequents. Olive-brown feathers on the upperparts of the White-necked Thrush contrast with light grey feathers underneath it. This bird has a brown and white streaked upper throat and a clear white lower throat. The light grey colour of the belly fades to white at the bird’s posterior. The White-necked Thrush measures eight inches and is found in Central and South America, in areas east of the Andes. On a quiet walk through Springhill Estate the White-necked Thrush may be seen hopping along our trails and even perched on our hand rails. However, it hardly allows you get close to it. This Thrush eats fruit as well as invertebrates from the ground. Its breeding season peaks between March and June. Amid the rainforest, tracking down the White-necked Thrush can be both challenging and rewarding especially when one gets a peek of the bird, camouflaged among the foliage. Hilty, Steven L. Birds of Venezuela. Princeton University Press. 2003.